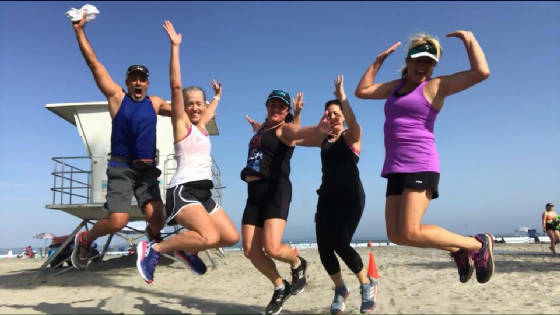 Sole to Soul Running is a very special kind of running/walking group. No matter what your fitness level, you'll find the support you need to accomplish goals you never thought were possible! We offer support if you're just starting out or an experienced runner or walker. It's a great time to run -- or learn to run -- or walk. This group is for YOU; no matter what your pace or experience, we think you're perfect! Our Facebook page is your best source for up-to-date training and race information! I'm not a certified coach or physician -- just someone who knows that running with wonderful people makes for a wonderful life. Please see About Us for important information about my coaching skills (or lack thereof). Here's the thing: It may start with the sole, but it changes the soul! We'd love for you to join us on our Saturday morning and race day adventures. See our Training Schedule each week for our meeting place and mileage. I wanted to talk a little about courage. It takes courage, after all, to start a training a program, to step out (literally) of your comfort zone and decide to challenge yourself. Deciding to making running or walking a regular part of your life can be scary! It takes courage to run when it's hard to run, to watch other people glide by you like they have wings, to keep going when you want to stop. It takes courage to set a goal and to say it out loud! That goal may be to complete an event every month, to run a half or full marathon, or to show up every Saturday to do what you can. It takes courage to start again, to remember being able to run mileage with ease (or at least that's why we want to remember!) and then to have your body complain with every step. So, today, I want to honor your courage for all that you've accomplished and encourage you to take new courageous adventures. Start with your soles. Come out and be with us. Be patient and kind to yourself with challenges that make you stronger every week. Set a goal. Tell us about! Let us help you route your success. Nourish your souls. Find support and compassion and encouragement. Make the transition from dream to reality with love. Start small. Finish big! And remember, it's easy to do things that are easy, but true joy comes from working through the hard stuff and learning what you can do. Be at peace with your pace, and know that I am constantly awed and inspired by your courage. Many of our members joined Sole to Soul to train for their first 1/2 marathon. Most of us never thought that running 13.1 miles was even possible when we first started training but, together, we learned that we could do it. Our running motto is "At Peace With My Pace." I believe that with encouragement and support, you can cross the finish line -- still upright, smiling and ready to sign up for another adventure. You can do this, too; please email me with questions! It takes courage to set a goal, but it feels SO GOOD to get there!